Sweet Potato Stuffing is a delicious addition to any holiday meal. The sweetness of the sweet potatoes melds all the flavors of sweet potato stuffing together. Thanksgiving is over and Christmas is only 10 days away! That means there are only 10 days left to officially eat stuffing! We better get to eatin’! Stuffing is good anytime of the year – it is one of those comfort foods. It has to be with all the cubed bread, butter and broth used to make traditional herbed bread stuffing. But, it only seems right to eat it during the holiday season for some reason – it’s a shame really. I think I will be making an exception with Sweet Potato Stuffing – I here and now declare that it is legal to eat anyyyyytime of the year! I am sure that most of you have a traditional stuffing recipe for the holidays but, do you ever have enough? After all, the innerds of a turkey are not that big! How much can you really stuff in that bird? 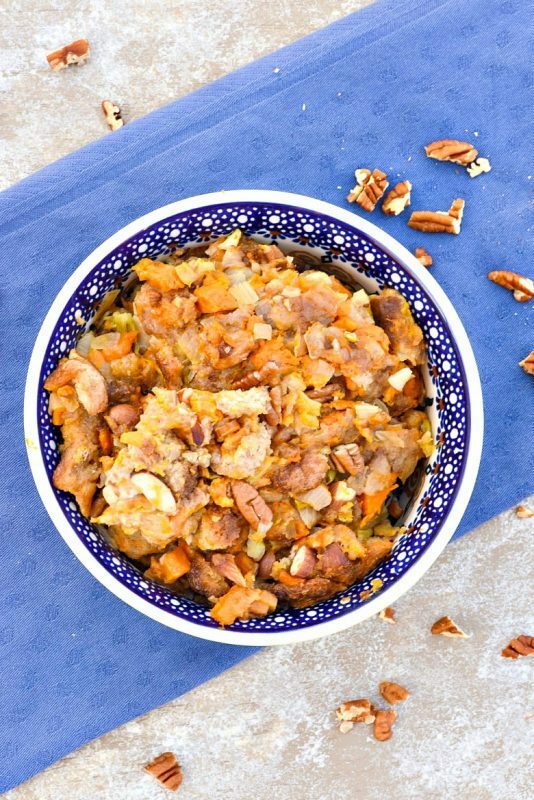 This Sweet Potato Stuffing Is Baked In The Crock Pot! 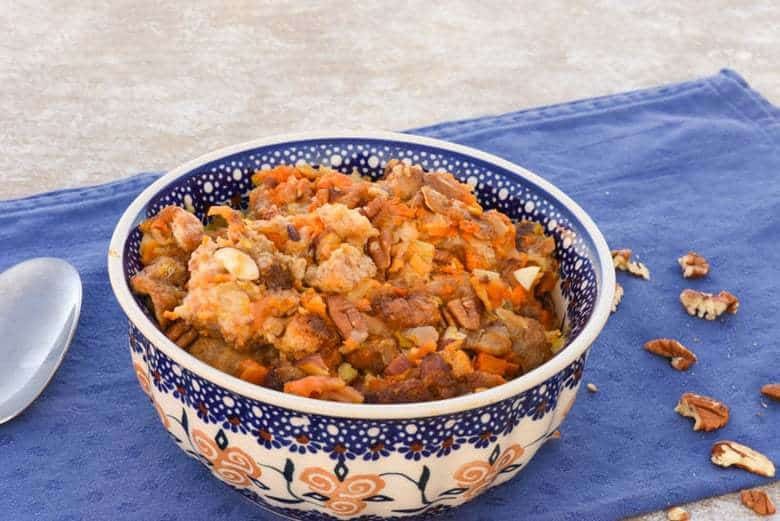 So, while you may not want to replace your holiday stuffing with a new recipe, Sweet Potato Stuffing is baked in the crock pot and can be made in addition to your regular stuffing! And, the color! How festive are the orange sweet potatoes peeking out and around the bread crumbs! Just what a festive table needs – more color AND more delish! But wait, there’s more! Don’t forget the sweetness! The sweetness of the sweet potatoes just blends the rest of the flavors together in mouth watering goodness – ooohhh my! Excuse me, I’ve got to go get me a bowl! 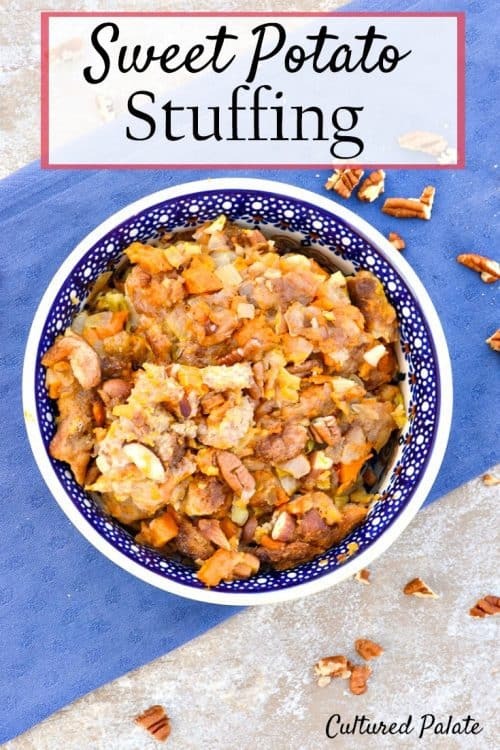 If you’ve tried this sweet potato stuffing or any other recipe on Cultured Palate please take a minute to rate the recipe and leave a comment letting me know how you liked it. I love hearing from you! You can also FOLLOW ME on PINTEREST, FACEBOOK, INSTAGRAM, YouTube and TWITTER. Healthy carbs can make this stuffing perfect as a side dish. Add onions and celery - cook until the onions are translucent and celery tender. Transfer to a 6 qt crock pot. Cook covered on low for 4 hours. Thanks, Saundra, I appreciate your encouragement and glad you like the e-book! Also, thank you for taking the time to comment!